When you suffer a miscarriage (which is defined as a pregnancy loss before 20 weeks of gestation), you usually don’t know what triggered or caused it. Losing an unborn baby can be heartbreaking, especially if you’ve had your heart set on being a mother. In most cases, you aren’t to blame for your miscarriage. In 1 out of every 2 miscarriages that occur in the first trimester, the pregnancy loss is caused by a complication called a blighted ovum (also called an anembryonic pregnancy). 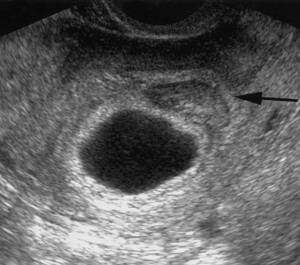 A blighted ovum occurs very early in the conception process. Some women who experience this complication never knew they were pregnant; others get a positive home pregnancy test, but weeks later, at their prenatal visit, the embryo doesn’t show up on the ultrasound. A blighted ovum is one of the most common causes of early miscarriage in the first trimester. It occurs when the fertilized egg implants in your uterus, but for some reason, the embryo doesn’t form or it stops developing very early. For this reason, a blighted ovum is often referred to as an early pregnancy failure or an anembryonic gestation (which means a pregnancy without an embryo). When you have a blighted ovum, the pregnancy sac develops in your womb, but the sac does not contain an embryo. If you experienced a miscarriage from a blighted ovum, you may not learn of your loss until the end of your trimester. With a blighted ovum, you can still get a positive home pregnancy test. Although the gestational sac is empty, the placenta has started to secrete human chorionic gonadotropin (hCG), which is the hormone that pregnancy tests measure. You may also start to experience early signs of pregnancy – such as fatigue, tender breasts, and morning sickness. Once hormonal levels start to decrease, these symptoms will go away and you will experience spotting or bleeding. If you experience a miscarriage from a blighted ovum, you may experience abdominal cramps, vaginal spotting or bleeding, and a heavy period. Because spotting and light cramping can be easily mistaken as implantation bleeding, women with a blighted ovum will not realize that anything is wrong with their pregnancy until they have an ultrasound. Keep in mind that you didn’t do anything to cause this pregnancy complication. Experts believe that a blighted ovum is the result of a chromosomal abnormality (problems in the structures that carry genes). Sometimes, a poor quality egg or poor sperm is to blame for a blighted ovum. It’s also possible that the anembryonic pregnancy is due to abnormal cell division. Regardless of what causes a blighted ovum, your body recognizes that this abnormal fertilized egg cannot develop into a healthy baby, so you will have a first trimester miscarriage. The miscarriage process can be immediate, or it can take weeks for your body to expel the gestational sac and tissue. What Happens if You Have an Early Miscarriage? Once you discover that you have a blighted ovum, it may be too emotionally exhausting or too painful (especially if you’re cramping) for you to wait for your body to miscarry. In this case, your doctor may give you medications to speed up the miscarriage process. Sometimes, he or she may recommend that you undergo a procedure called a D&C (dilation and curettage) to remove the tissue. It’s generally recommended that you have a D&C procedure if you’re bleeding a lot, or there are any signs of infection. For most women, a blighted ovum is a one-time occurrence. They go on to have healthy pregnancies and babies. Fertility specialists don’t consider a single miscarriage as a sign that there’s anything wrong with you. In most cases, you won’t undergo special blood tests or genetic tests until you have at least two consecutive miscarriages.